A Parasite is an organism that lives and survives by sucking the life-blood of its host. The parasite typically grows fat as the host grows thinner, and finally drops dead! Such is the outlook of the 2018 National budget, and the Zambian CAPITALISTIC body Politick in general – a body of ticks sucking Zambians dry, financially and literally! It must be borne in the minds of all right-thinking and well-meaning Zambians that the so-called National budget of K71 billion is, figuratively and practically speaking; a cake in the hands of the few – a cake that will only be shared and enjoyed by the few Zambians and foreign companies occupying positions of privilege! Make no mistake fellow Zambians, have no illusions; the 2018 budget, just like all budgets before it, are to the exclusion of the majority of ordinary and long-suffering and down-trodden Zambians. The 2018 budget is a budget of the few, by the few, and for the few! It is yet another disaster in the life of Zambians who are forced and compelled to contribute exorbitant taxes to the national coffers, but never get anything in return! Foreign Exploiters Can Rejoice over the Budget! In this sense, it must be stated that the National budget is in fact a Sectional and factional budget as it carters to the whims, caprices and monetary appetites of a narrow, rich and selfish section of society – the corrupt political elite and their gang of business associates – mainly European and American, Chinese, Indian, and Lebanese international exploiters! Not one single mine or major industry in Zambia has been touched, not even the mines from whom we should be getting a lions share of taxes! Why, because the current political elites are actually in bed with foreigners and serving as shareholders on the boards of this companies – and in fact, the wife to Minister of finance Felix Mutati is serving on the board of an Indian company – Dr. Agarawal Eye hospital of Lusaka’s North-mead area, and she earns $15,000 dollars, or K150,000 every month, and she reports for work only once in three months! As for the rest of us Zambians, we can forget of anything good coming out for from the budget, since we still have to meet our own cost of living which is ever rising, and the majority are either unemployed or underpaid, and definitely exploited and unprotected! 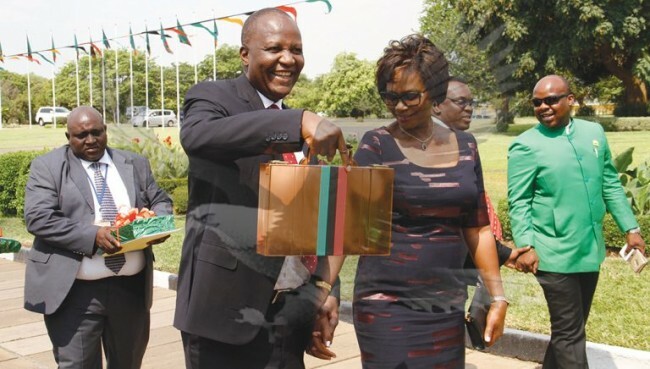 Even after the flamboyant presentation of the budget by one IMF puppet in the name of Felix Mutati, Minister of finance, and opposition MMD leader, the general poverty situation of the Zambian people, which stands at 86%, still remains the highest in the world, worse than in war-torn countries like Somalia and South Sudan! And this year, poverty promises to get worse as 2018 sets on. The boisterous laughter, jeers, name-calling and cat-calls coming from the well well-fed Parliamentarians is proof of betrayal of the Zambian people; because while these MP’s cheer and laugh and bicker about the budget, and engage in mock-concern for the poor, millions of Zambians have no jobs, no income, no access to healthcare and education, no proper housing and no social security. The endless charade that goes on in that House of Parasites cannot quench the thirst, hunger, and now anger of the masses, but just goes to show that Parliament is a house of fat cats in politics and in parliament to serve their own bellies and necks. The sooner they are thrown out and thrown off the backs of the toiling masses the better! While the 2017 budget did nothing more than maintain the status quo of poverty, the 2018 budget has not only maintained poverty, but promises to increase it. The 2018 budget is a bad budget, it is utter nonsense, criminal, and a robbery of the poor and oppressed majority of Zambians! Electricity tariffs have increase almost 100% as of September this year; and as if to add insult to injury, the so-called TV Levy has increased by 50% as well, and this is a fee that should never have existed in the first place! It is day-light theft from even those who are too poor to own a TV set. Meanwhile, the TV levy will go into the pockets of the now Chinese owned public broadcaster – ZNBC! There is absolutely no initiative to create jobs for the millions of unemployed Zambian youths in this budget, despite the fact that we have now reached a point where youth unemployment has become a national crisis! Yet some mindless minions from the state Central Statistics Office have the sheer audacity to insult our intelligence by claiming that the unemployment is at 10%!! But this is the sheer callousness of this government, lying is the order of the day! The unemployment situation is serious, and constitutes a time-bomb if not resolved in time! The bottom-line is that for a youth who is unemployed and/or underpaid and exploited, the budget means nothing! It is a waste of paper only useful to be flushed in the toilet! For the hungry mother and child on the street selling tomatoes and cucumbers, fruits and goodies of all climes, the budget is utter rubbish for it does not promise free porridge for the baby, no buy the cheapest bathing soap for a woman to wash off the sweat of her daily toil. For the youth the budget does not pay rent, school fees, or even afford one a pair of shoes finished from walking the streets in search of peace-work to buy some food at the end of the day! Therefore, the Zambian budget is, in its entirety and totality, a complex and good-for-nothing piece of document not worth anything to the majority of Zambians who suffer day and night, and are tired of the political and parliamentary rhetoric and empty promises that never put food on their tables!